Laser Engineering's advanced Ultra MD™ sealed CO2 surgical lasers offer unmatched precision, power and versatility, backed by the experience and support services of a company with over 20 years of surgical laser experience. The LEI Ultra MD™ CO2 laser systems utilize a user friendly interface which is microprocessor controlled making it simple to setup and to operate. The sophisticated features of the Ultra MD™ series of surgical CO2 lasers include continuous wave, chopped pulse, and super pulse settings - all ready at the touch of a finger - and all in a convenient, space savings compact size. The CO2 laser system is offered in three wattages: 40,60 and 80. - 20 to 40 Watts of super pulse (depending on model), enabling less thermal damage on tissue resulting in "Char-Free" effect. - New operating system with touch-screen activation, increasing ease of use for surgical and technical teams. - Remote diagnostics reducing repair and trouble-shooting time. System Weight 190 lbs. 190 lbs. 205 lbs. 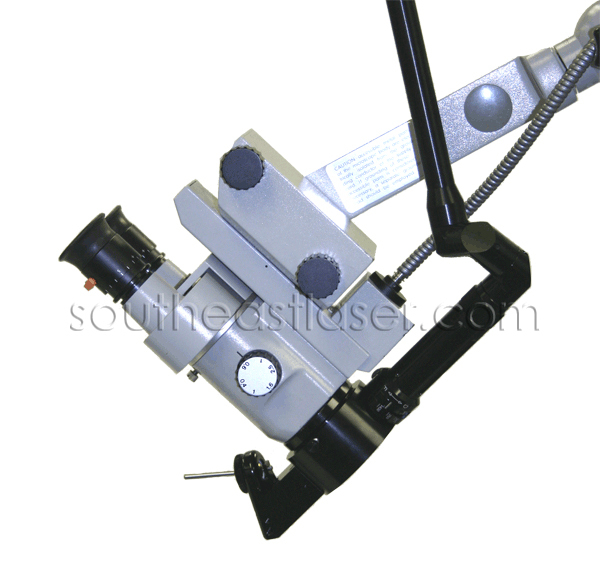 The 125mm hand piece focuses the laser to 0.2mm spot size creating maximum power densities. 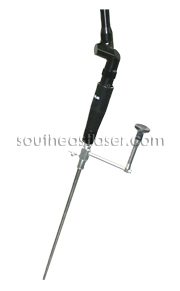 The hand piece can be partially disassembled for sterilization or draped to maintain a sterile field. There are several end piece accessories that are available; mirrors to deflect the laser at extreme angles and a distance gauge for easily finding the focal length.